The Indian car market for the first time ever will have a muscle car category, thanks to the Ford Mustang which has been launched in the country at an ex-showroom price (Delhi) of Rs 65 lakh. Ford has brought only one variant of the Mustang to India, and that will be the 5-litre V8 petrol engine coupled to a six-speed automatic transmission. The variant that will be sold in India will feature the same mill that is present on models in the international market but it will be tuned down a tad to produce only 395bhp of peak power and 515Nm of peak torque. The same mill in other markets is tuned to produce 435bhp and 542Nm of torque. The Mustang gets 8 airbags, which include knee airbags, crash sensors, safety belt pre-tensioners and Ford My Key. Other than that, 19-inch wheels and performance brakes along with the SYNC 2 voice control paired to an 8-inch touchscreen. The Mustang will be coming to India as a CBU unit and the top speed of the car has been electronically limited at 250kmph. The Mustang which will be sold in India has a fastback design and gets the special performance pack as standard equipment which includes a limited-slip sports differential and four driving modes, which are Normal, Sport+, Track and Wet. The Mustang has a ground clearance of 137mm and the boot can hold up to 383 litres of cargo. Despite being a 2-door car, the Mustang can seat four people. The car measures 4784mm in length, 2080mm in width and 1391mm in height. The fuel tank has a 61 litre capacity. 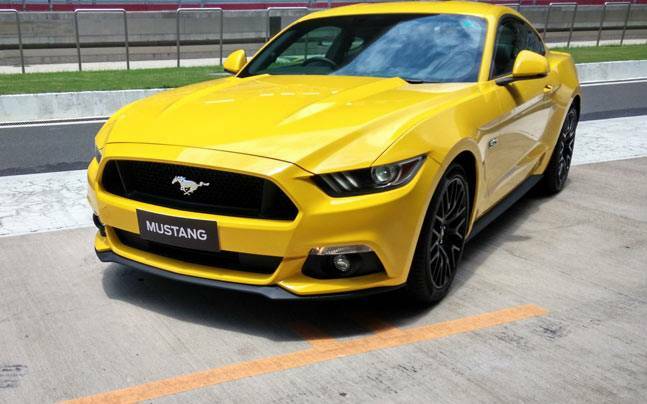 Be the first to comment on "Ford Mustang launched in India for Rs 65 lakh"